Editor's Comments: This article is titled "The Rarest Dash Plaque" because the 1970 Ponca City Grand Prix was never held, yet the dash plaques commemorating this "non-event" were ordered and received before the races were cancelled. I imagine two hundred or more were in the Region inventory, but I know of only three that have survived. The 1969 Ponca City Grand Prix (PCGP) was an outstanding success, record number of entries, good spectator attendance and competitive raceing. 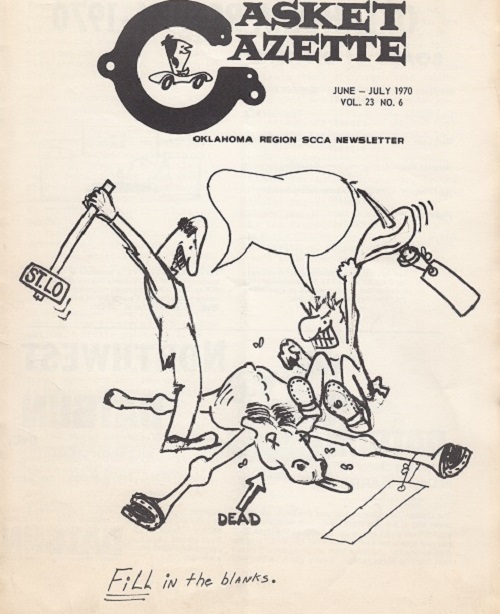 Oklahoma Region looked forward with great anticipation to 1970. But that year there was no racing in Ponca City. Racing on the July 4th weekend had become a tradition when Kansas City Region first hosted National Races at Lake Garnett in 1959. Oklahoma Region inherited the date in 1965 after racing at Laker Garnett was cancelled due to the 1964 riots. Mid America Raceways (MAR) also wanted the Independence Day weekend and made a successful takeover of the date in 1970. The cancellation of the 1970 PCGP is a tale of dramatic events, maybe even conspiracy and skullduggery. Presented here are factual items from the Gasket Gazette; readers can decide for themselves who was most responsible . William "Doc" Foerster: Regional Executive of Oklahoma Region and licensed competition driver. Doc raced out of Oklahoma Region from 1961 through 1964 when he moved to St. Louis to complete his residency requirements in plastic surgery. He returned to Oklahoma in 1968. 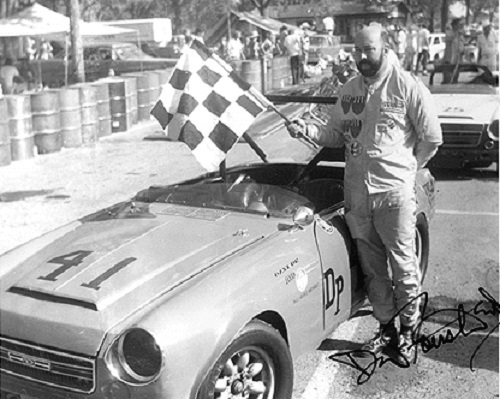 Doc tied for 5th place in 1969 Midwest Division (MIDIV) D Production points in a Datsun 2000. Mel Bogus: Regional Executive of St. Louis Region. 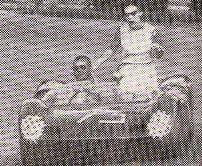 A licensed competition driver, Mel was a sales representative for a fashion dress manufacturer and towed his race cars with his mobile home, which doubled as his showroom. 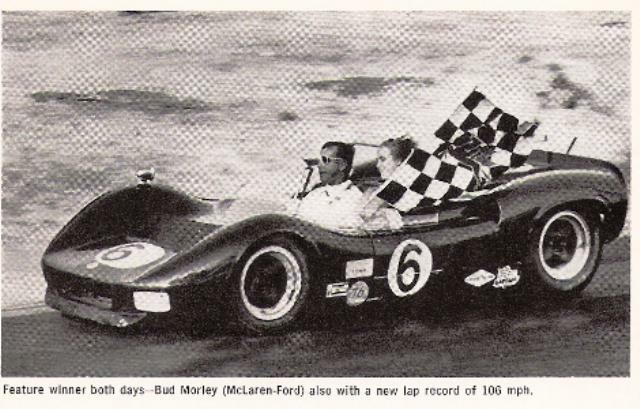 Mel tied with Doc Foerster for 5th place in 1969 Midwest Division (MIDIV) D Production points in a Datsun 2000. Dave Dooley. Area 6 (Oklahoma, Kansas, Nebtaska, Iowa , Missouri and Arkansas) SCCA Governor. A licensed competition driver, David was Competition Chairman of Oklahoma Region. Alex Keller: Area * (Colorado and New Mexico) SCCA Governor. Lester Seasongood: His "Commercial Insurers Agency" in St. Louis insured almost every SCCA event from 1959 through 1974. Jim Patterson: SCCA Westport Director of Club Racing. Ron Zimmerman. SCCA Westport Assistant Director of Club Racing. Jack Hunter: Executive Steward of MIDIV and member of St. Louis Region. William Johnson: Scheduling Chairman of MIDIV and licensed competition driver from Kansas City Region. FIR (Frontier International Raceway): A drag strip built by Bob Drake, a former Oklahoma Region licensed competition driver. 1969 was a bad year for accidents in SCCA racing, and SCCA was concerned with escalating insurance costs and litigation expenses. 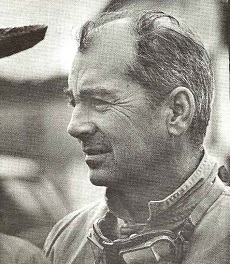 In the January, 1970 issue of “Sports Car,” SCCA insurance agent Lester Seasongood wrote: “I hope 1970 marks the beginning of a strong and vigorous campaign toward safety consciousness at every level of our activity-and an enforcement program that will prove that our record reflects our effort. Following receipt of this information at the SCCA national office, the facility may be granted temporary approval by both the SCCA Director of Club Racing and the Executive Steward of the division involved. Final approval will be given a course subject to inspection by a committee consisting or the director of club racing or the director of professional racing, the executive steward of the division involved, the SCCA insurance counsel and such other qualified personnel as they may deem necessary. Such inspections will be implemented as quickly as possible." responded to the resulting increased event insurance rates dictated by Lester Seasongood and the Board of Governors course approval demands, with these perhaps sarcastic, but foreboding comments: “...We could modestly hope to gross $84.00 on this race and keep the entry fee to a low $65.00. This is, of course, if our sponsor will pick up the tab on everything else-and, of course, if our course is "re" approved. At this time the regional race has been canceled at Stuttgart and the National race for April appears doubtful. Our own regional at Stillwater is almost certainly out as well. So the usually active MIDIV racing for April appears to be a single Drivers School scheduled April ll and 12 at Salina, Kansas. At the National Convention the competition board 'suggested' the MIDIV only needs to have 3 National Races - their generosity is overwhelming but apparently prophetic. "A low dim light hung over the gaming table as the croupier of Seasonbad's Palace passed the dice to the St. Louis flash, Mel Bonus. One; two; three straight passes! -- beads of sweat formed on the forehead of manager Jim Patterfinger as Bonus baby readied the dice for his fourth throw. It was looking bad for the Palace as they had doubled the minimum bets hoping only the big time boys would play this year. "Here's one for ol' K.C." whispered Mel as the dice danced over the green and struck the opposing board. Seven it was and a fourth win for the Midwest Cowboy. Scarcely noticed in the back of the room stood two Oklahoma badmen, Dave Dooligan and Doc Faraday. Slowly they moved toward the table until they stood at opposite ends from Mel. Their determined looks caught Mel by surprise but only for a moment. "These dice are as hot as the fourth of July, and I'm going to get it too," said Mel as he flung the cubes toward the bad guys. For a split second the dice hung on seven and to the surprise of all flipped over to snake eyes. "You crapped out on that one, Mel,"said Dave as he took over the dice and passed them to Doc, “and we're going to Ponca and we're going with dough," said Doc. "and we're going in July, come on dice and really fly!” Bounce, bounce, bounce, six bounce. bounce five -- ll it was and Ponca was in. The bad boys had made good and before it was over, the hot dice had brought wins to bad guys from Tulsa, Denver and Wichita, too. So gang, that's the way it was at Salina: 8 Nationals for the MIDIV with only MAR approved for sure. St. Louis wanted our 4th of July date but didn't get it. Many, many problems to work out to get Lake Ponca approved. Garnett has fallen by the wayside. CDR, Afton, and War Bonnet have dates but like Ponca no approval yet. Dooley is to test water barrels at Frontier International Raceway in an attempt to prove their efficiency as barriers (Continental Oil probably has only 2 or 3 million spare barrels in Ponca City) since track safety experts Patterson and Seasongood not too sure what is safe and what is half safe. Eleven Regionals scheduled as well as six Driver Schools (anyone for Igloo?). See schedule in this issue for details. Ok, gang, hang tight -- we're going to win! Ponca City was not approved by SCCA Westport in late May. Doc Foerster wrote this "OPEN LETTER TO THE ST LOUIS REGION" for the June Gazette. "As you know there will be no race at Ponca City on July 4, 1970. The consequences are much more significant than a simple loss of a race to the Oklahoma Region. It means the loss of another race course for the Midwest Division and probably marks the demise of all natural road racing circuits in the United States. The blood, sweat and tears that poured into Ponca this year probably cannot be matched by any other region anywhere and it appears to us that other attempts will likewise be doomed to failure. Gaining course approval for a temporary road circuit over the opposition of a highly prejudiced and basically uncooperative director of club racing is almost an insurmountable task itself. We, the members of the Oklahoma Reglon, were able to do this, but it was extremely difficult. The reason there is no race at Ponca is complex and difficult to pinpoint but can be narrowed down to an over ambitious regional executive of the St Louis region and a wishy-washy calendar chairman of the Midwest Division. Let, us begin with the MIDIV meeting in April at Salina. A carefully planned attempt to secure the Ponca City date by your R.E., MeL Bogus, had been organized even before the meeting. Due to the rhetoric of David Dooley this attempt to take the date was thwarted and Ponca Clty was allotted to the Oklahoma Region for July 4th. Based on the fact that Dooley and I were virtually certain that between our region and the Ponca City sponsors (AM.BUCS ) the so called safety suggestions could be met and we were able to secure our date. I was not present at the Ponca City inspection but David was, and thus was in a posltion to make such a statement of certainty. Patterson openly stated at this meetlng that he would have the written course requirements for me within a week as it was imperative that, such be in written form in order to negotiate with a sponsor such as the AMBUCS. Ponca City is, of course, a temporary course and unlike M.A.R. one cannot run out and begin construction on suggestions. Because Dooley and I were aware of the problems inherent in securing the requirements in writing, negotiating wlth the AMBUCS, worklng out areas of ambiguity wlth Patterson, synthesizing the facets into a composlte race program, etc. We knew this would require considerabLe time thus when Alex Keller proposed that Oklahoma Region be given to May 10 to do this Dooley and I immedtately explained the arbitrariness of using a specific date. Keller's proposal died for lack of a second, nevertheless, this so called May 10 date has been used as a weapon by others in their attempts to scuttle Ponca. This one thing has probably been misquoted more than any other of several misrepresentatlons. In any event, the MIDIV meeting ended wlth the July 4 date asslgned to Oklahoma Region with the understanding that in the event that the Oklahoma Region dld not have a sultable site for the July 4 race, the date could be given to the St. Louis Region with a reasonable time remaining for them to organize a race for that date. The written requlrements for the Ponca City course were never sent to me by Jim Patterson. I did receive, however, a suggested plan on hour to go about this by Jack Hunter early in May. Our club immediately went to work measuring, plotting, and diagramming the entire course corner by corner and sent this to Patterson and to Hunter in an attempt to gain temporary approval. No reply was ever made to these safety specifications. In the meantIme the AMBUCS had written Seasongood concerning the insuranee premium and were given the written requirements for the course. Not knowing exactly what this was all about they wrote back to Seasongood saying in essence that they had always had safe races and could see no reason for cutting trees or doing anything different. Patterson immediately capitalized on this letter to claim that Ponca City was disapproved. All this was going on without the Oklahoma Region knowing anything about it, as we were waiting on the requirements from Westport. Under no circumstances should they have been sent to AMBUCS before they were sent to us, and such a mistake on the part of Patterson and Seasongood was inexcusable. Just a few days before the M.A.R. race ln May, Dooley discovered what had happened and was able to get from Ron Zimmerman a copy of these requirements. Since he was attending the governors conference in Chicago the same weekend as the M.A.R race, he set out to negotiate the ambiguities with Patterson so that the course could be approved, and this is exactly what Dooley did. Much to Paterson's dismay and resistance Dooley was able to come up wlth negotiated requirements that could be met by the AMBUCS and the Oklahoma Region. While in these negotiations Dooley personally talked by telephone to Mel Bogus stating for him not to make any rash announcements about Ponca not being an available site for the Oklahoma Region. Nevertheless, Bogus on his own, announced to Bill Johnson, Jack Hunter and myself on Sunday morning that Ponca had been disapproved by Patterson. On this erroneous assumption Johnson assigned the race date to St. Louis over my objections that we walt until Monday morning when I had a chance to confer with Dooley. The gentlemen's agreement entered lnto between Bogus and myself was based on the assumption that, unless the Oklahoma Reglon did not have a suitable site for July 4th weekend then and only then would a co-sponsored race be held at St. Louis. On Monday morning Dooley informed me that he and Patterson hadreached an agreement on Ponca City requirernents and, that we would have a race. The only negotiations left were with the AMBUCS to formally approve the changes in course requirements. I immediately called Bill Johnson to inform him that we had been misled at St. Louis, that Ponca City had not been disqualified and that the Oklahoma Region was going to have their race after all. Johnson seemed pleased, said that there would be no problem and that we would have our date. I told Johnson l would call him back in a day or two for absolute confirmation of negotiations with the AMBUCS. Two days later when I confirmed the absolute certainty of the Ponca races to Johnson he began talking very wishy-washy about our date saying that Patterson did not concur that our course had met the approval standards. This, of course, was simply untrue as Dooley and Patterson had been in agreement ln Chicago. To make a long story short, Patterson awarded the sanction to M.A.R. instead of Ponca. Based on Johnson's decision to give our date to M.A.R., on Sunday, May 23 the appeal to the competition board was turned down foragain the same reason. The two main arguments were that May 10 was the cutoff date for the Oklahoma Region which as stated earlier was absolutely untrue, and that Oklahoma Region could not meet the safety requirements at Ponca which again was absolutely untrue. As I said earlier the people in the Oklahoma Region have no animosity toward those of the St. Louis Region but, you may judge for yourself what we think about certain others. Doc's RE-PORT column in the June Gazette opened with a verse from Henley's Invictus, folowed by a eulogy. "It is with great sorrow and shredded heart strings we put to rest our beloved Ponca. She was only nine years old going on ten when her life was brutally snuffed out. On the verge of maturity when death came, our Ponca unequivocally would have become a truly beautiful woman had she been allowed to live. All who knew her loved and praised her. Her friendliness, courtesy and charm were legendary. There are no words, no eloquent phrases, no gilded eulogies to ever soothe our frustration and grief. We have lost our dearest friend, our own creation, yes indeed our own flesh and blood, sweat and tears. Her trial was in reality a mockery as she was condemned to death from the start. Her basic right of innocence till proven guilty was disregarded. Although she followed the protocol of righteousness she was branded a heretic. Like Joan de Are she was burned at the stake without regard to justice, fair play, and reasonableness. There was no jury of her peers, only a tribunal, a kangaroo court to hear her pleas. How does one prove innocence to a crime not yet committed?? ? Yes, unbelievable as it mav seem she was executed on the basis of not what she had done but on what her enemies professed she had done. Not on truth but on lies. Not on fairness but on conspiracy. Oh, woeful and shameful tribunal our lovely daughter slain, our hearts torn asunder. We must now gather up the fragments of our love, our shattered psyche. Although the pieces are distorted, ragged, and bloody we must reshape, remold, and cleanse them. We must rebuild we must press forward we must try again. We must not wince or cry aloud. Let us keep our sorrow to ourselves and show nothing to the world but fortitude. But let us never forget what they did to us one sunny day in June." An interesting telegram from Mel Bogus to the Oklahoma Region R.E. "After reading your open letter to the St. Louis Region an almost uncontrollable urge came over me to whisper in your ear those three little words, "'you're a liar'." 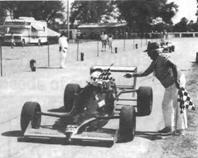 Racing returned to Ponca City in 1971, on the coveted July 4th weekend, and continued as such until 1992. MAR held its last race in 1984. 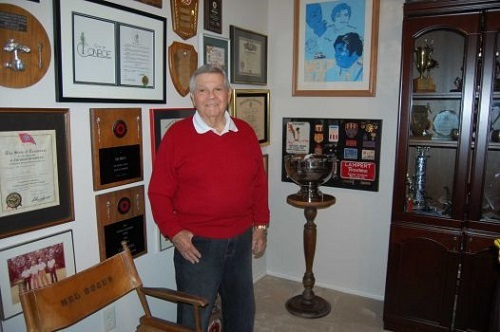 Lester Seasongood lost his insurance business with SCCA Westport in 1974 to K&K Insurance. 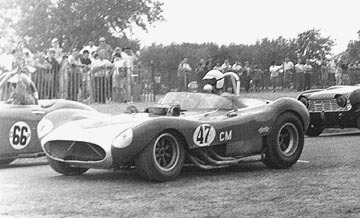 SCCA Westport and MIDIV called for Oklahoma Region to vote on whether it should remain in MIDIV or join the Southwest Division, SCCA, in November, 1970 with the caveat that the move would be forever permanent. Doc Foerster led a friendly campaign to join Southwes Division, but the membership voted to stay.